Reading Dear Failures, Trey Sager’s chapbook of poems addressed to his failed writing projects, brought to mind a fragment from Eileen Myles’ Inferno. Myles claims: “In a way, poetry really does require failure, because failure produces space. That nobody else wants. Poets as a group hate success.” Dear Failures claims that space that failure produces, describing the cast-off projects and turns of phrase that no one wanted. It’s a wry celebration of failing over and over again. 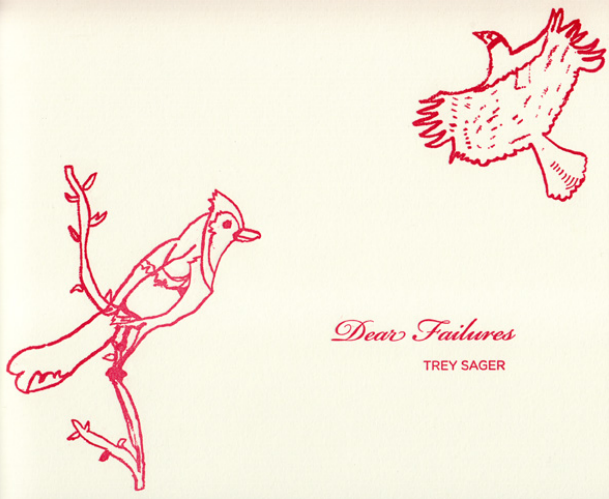 By beginning the title of each poem in the chapbook with “dear,” Sager displays tenderness towards his failures. He speaks to them in the second person, and their failed traits appear in glimpses. but I know nothing about war or xenophobia. poem because I have an ego problem. Saying “Dear” in the title and “You” in the first line, the poet addresses his poem as an entity he’s failed to serve, lacking the knowledge to make it what it “wanted to be” but refusing to let it go. The poem failed at being about war and xenophobia; the poet failed at writing that poem, and then failed some more by having an ego problem. but that’s kind of sad, to compare you to a diaper. Breaking down the joke he was going to make, Sager overexplains this incorrect simile. The chapbook is deeply self-reflexive, yet rewards even a facile reading with humor. The humor is particularly acute if the reader is a poet: a frequent perpetrator of his or her own failures. You begin with Facing the truculent moonlight. In other words, moonlight is not truculent. You end with the passengers who tried floating eventually drowned. That sounds like the fate of everything ever attempted. Throughout Dear Failures, amused ambivalence meets the questions of fate and existence. It’s as if the chapbook is shrugging in uncertainty, saying “Who knows what anything is really about.” The first and last poems both mention Buddhist ideas of identity and oneness, repeating the circular structure of individual poems on the full chapbook’s scale. Poetry is positively gluttonous for failure, even through its most apparently successful, published and recognized avatars. While Dear Failures feeds this failure-hunger, it also surprises and entertains. Erin Watson is a Southern person in Chicago. She writes poetry slowly and lives online at torridly.org.